‘Saber Strike’. What is American army doing on border with Belarus? If you are going to travel to Poland and the Baltic States in your car in the first half of June, prepare to let pass the huge military columns of NATO technology. The “Saber Strike” exercise begins there — regular, but largest in its history in terms of the number of participants. In the military sense, maneuvers do not pose a threat to Belarus, but in the political sense, Moscow will certainly take advantage of them. Hundreds of American Strikers and Humvees left Germany for Lithuania. In the former Warsaw Pact countries, the majority of the population welcomes Americans as guarantors of peace and tranquility. “In the next few days, literally thousands of NATO soldiers will travel through Europe to participate in the ‘Saber Strike’ excercise in Poland, Lithuania, and Latvia,” says Steve King, US Ambassador to the Czech Republic. The annual exercise of the US ground forces in Europe called ‘Saber Strike’previously had no more than two thousand participants. But after the Russian aggression against Ukraine, everything changed. This year, “Saber Strike” involves 18,000 troops from 19 NATO countries and allied countries, almost a thousand highly mobile armored cars, more than 60 helicopters and nearly fifty tanks. “This year’s edition has much more and much faster and much more syncronised operations. It is combined with the series of other exercises that are going on in the region. So, concurrently, Baltic operations, or large naval exercises going on in the Baltic, additionally Swift Response, which is another US exercise which has a global response force. It also includes two other national exercises of Lithuania and Latvia,” commented Ray Wójcik, former military attache of the US Embassy in Warsaw, and now the director of the Polish office of the Washington based Center for European Policy Analysis. “Baltic Operations” or “BALTOPS” have already started in Lithuania, involving four dozen warships from 15 countries and 4 thousand military seamen. “Like all exercises, ‘BALTOPS’ is aimed at all types of military operations, including combat against submarines, air defense, combat against warships,” says the head of the Lithuanian Navy’s headquarters. The key maneuver of the exercises is the rapid relocation of the Second Cavalry Regiment of the US Army from the place of permanent deployment. From the German Filsek, through the Czech Republic and Poland, they are moving towards the Polish Suwalki. It is not far from Belarus. Ray Wójcik, former US military attaché in Poland, says that “Saber Strike” is primarily a test of the troops mobility, the ability at all levels to respond quickly to the attack of the enemy and bring reinforcement to the desired area. “Security of NATO, NATO nations, our partners is absolutely a bed rock of our commitment. The US and our partners in NATO demonstrate the exercises are true so that no one should make a mistake about how we think about security in this region,” continues Ray Wójcik. Suwalki was chosen for a reason. The Suwalki corridor is the most likely place of attack of Russian troops from the Kaliningrad region and the Belarusian territory. 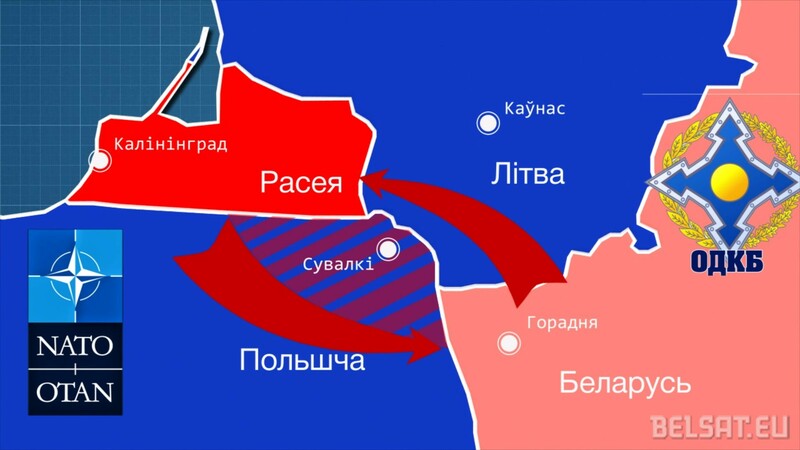 If it comes to a big war, it is here that the Russians will cut off the Baltic countries from their allies. “There is a very aggressive state next to us. Next to us is the Kremlin, which does not hide its aggression and shows it in concrete steps, annexing and attacking neighboring states,” says Rasa Juknevičienė, Lithuanian Defense Minister in 2008-2012. In a sense, “Saber Strike 2018” is a response to the West-2017 exercise, which took place not only in the Belarusian territory, but also in the whole west of Russia, and in the Baltic Sea. Officially, it involved 13,000 servicemen fighting against illegal armed formations. Unofficially, there were 120,000 participants, working out a massive blow to neighboring countries and forcing the world to peace using nuclear missiles. “They have a scenario for the public, and the scenario we know about is what is happening on the field, which troops are involved. These troops are for attack, not defense. And the scenario includes the use of nuclear weapons,” Rasa Juknevičienė says. Russia will react to the Saber Strike politically, once again demanding that Belarus strengthen its military integration against the NATO threat. The expert believes that this may be an attempt to reformat the relations according to the Armenian model. “It is not only the deployment of Russian military bases on the Belarusian territory, but also the reassignment of the regional grouping of forces and an attempt to include it, together with other security forces of Belarus, in the grouping of troops in the western strategic direction,” continues Sivitsky. But this will be the next step to the loss of independence.